Auto salvage yards don’t have the best reputation, right? If this is your first time doing a search for auto salvage yards near me then you may not know that. Most people think junk car buyers are shady and are out to scam them, and often times that’s the case. But I’m here to help you steer clear of the bad ones and deal with the good auto salvage yards. Most auto salvage yards and tow truck drivers are honest and reputable, you just have to know what to do before you junk your car and what to look out for when you are selling your junk car. But there are some that will try to make a quick buck at your expense if you don’t look out for your own interests when you’re selling your car for salvage or scrap. Want to sell your car and rather call around then deal with us? We’ve put together a list of the top auto salvage yards in your city to make it easy for you to get other quotes. Our main goal is to simply the process for you. You can also check out our guide on everything to know about auto salvage yards. Not many consumers have extensive experience in dealing with local salvage yards or getting cash for their junk cars from other services. If you’ve always traded your cars in when you bought a new one, or sold your car on Craigslist, you might never have sold your old car for scrap or for parts to a scrap yard, and be unfamiliar with the process entirely. Or maybe you’ve bought some cheap used parts from a salvage yard before but never dealt with whole cars. 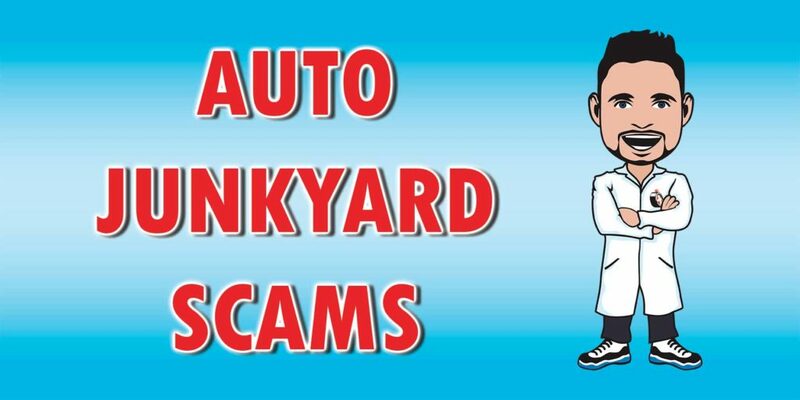 To help you get the most for your junk car, we’ve compiled a list of the 10 top scams that unscrupulous salvage yards attempt on novice car sellers. The auto salvage yard may be the ultimate destination for your old car, but it will probably be towed there on a flatbed wrecker. Not all salvage yards have their own towing service, and many hire any tow truck driver available when your car needs towing to their yard. Be especially cautious if you’re supposed to be paid in cash for your car. If the truck driver says that upon inspection, your car is worth less than they estimated, inform him that the deal is off and find another wrecking yard to do business with. Another favorite tactic of fly-by-night tow operators is to give you the check from the scrap yard for your car, but demand that you pay them in cash for the tow, even though they’re being paid by the car salvage yard already. If you’re not offered the same deal you agreed to on the phone with salvage yard, call them immediately, and don’t let the tow truck driver put your car on the hook until everything is settled to your satisfaction. Getting ripped off like this feels as bad as not getting money back from the IRS during tax season! When you sell your car to a auto salvage yard near me, you have to sign over the title for the car to make the transaction legal. The title to your car is related to the registration, but it’s not the same thing. If you don’t cancel the registration on your car in a timely fashion, you could be liable for anything that happens to the car after it’s already been hauled away. Some dishonest jun yards promise to handle the paperwork necessary to cancel or transfer the registration of your car, but later send you a bill for storing your car at their lot. A collection notice and a threat to report the bill to a credit-reporting agency often accompany this bill. That’s why it always pays to take care of the registration paperwork yourself, and take the plates off of your car before it’s towed away. Also make sure to vet anyone that will buy your car without a title. While it’s not impossible it gets a little tricker. When you negotiate for a price on your junk car, you should be totally honest in describing the condition of the car, and supply pictures of it if requested. You should also demand that the auto salvage yard keep their part of the bargain just as closely. Unscrupulous auto salvage yards will often agree to one price, and then offer you a much lower price when they show up to tow your car away. Never sign over the title to your car until you have a reliable check in the correct amount in your hand first. If the buyer attempts to renegotiate and offer you less money, decline the offer outright. Find a reputable salvage yard to buy your car, giving you the cash that you deserve without the hassle. Never settle for revised offers. Junk car buyers are good at getting people to the yard with their cars, only to state that the figures they offered are no longer valid. They know that once you’ve made the effort to get there, you won’t want to leave empty handed. Don’t sell your car simply because you are already at the salvage yard. Sometimes it may even be better to attempt some DIY auto repair and keep it on the road. Under no circumstances should you allow any auto salvage yard tow operator take your car away, or even put it on the tow hook, until you’ve been paid in full for the agreed amount. Once your car is out of your possession, you probably have nothing in writing that guarantees how much you’ll be paid for your car, and if you have a dispute with the yard over the agreed amount, they can charge you for towing and storage if you force them to return the car to end the deal. That could end up costing you more than the car is worth. Showing up without the payment in hand is another version of the bait and switch. Unless you agreed to deliver the car to the salvage yard, the price you were quoted should include towing. The majority of cars that are sold to the salvage yard are not in running condition, and towing the car is expected. Never pay towing charges directly to the tow driver, either, as we explained in fly-by-night hauler scams. You should get at least three quotes on the value of your junk car, just do a google search like this one. It’s better to stop dealing with shady dealers immediately when you suspect they’re taking advantage of you. The most common form of dishonest appraisals of a car is telling you that your car isn’t worth anything, but they’ll take it away for free to do you a favor. While it may seem like a good idea to let a salvage yard pick up your vehicle for free, it’s not. Your car still has some value. A car that’s bashed up, leaky, rusted out, or broken down still is worth some money. Even an abandoned car that has been rusting in the woods for decades has value as scrap metal, and your car is probably worth much more. There are many times buyers will try to undervalue your vehicle to make you think you’re lucky and getting a great deal. Anyone that tells you your car is worthless to see if you’ll go for it shouldn’t be trusted. Find other salvage yards to do business with. While you may not get much money for your car, you’ll likely get enough money to cover a couple car payments on your new vehicle. Also some may value it at zero if it is totaled. But totaled cars have options too. Shady businesses try to hide the actual amount of money in the deals they make by adding in extraneous offers, or by giving you vague estimates that depend on inspections of your car. It’s extremely important to have a firm quote of the value of your car before you agree to have it picked up, and make the scrap yard stick to it no matter what. Many scrap yards near me are now being gathered under the umbrella of larger Internet clearinghouses, and these businesses offer customers non-cash enticements to choose them over other salvage yards. The most common form of these offers is a coupon good for cruises or other kinds of vacations. It’s only after they have your car at below-market rates that you’ll discover that the coupons don’t save you any money, but instead require you to pay above-market rates for at least part of your vacation. Other coupons have so many restrictions on the travel dates that you’ll probably never get a chance to use them. In all cases, it’s smarter to tell the salvage yard that you want a hard number for your car and a printed check in the full amount in your hand, and that you’ll pay for your own vacations. If a salvage yard is trying to make the offer so sweet you can’t resist, watch out. There are dealers who will offer cash that is far below the going rate you deserve for your old car. They’ll try to offer incentives to make up for the lost money. While this may seem great at first, these coupons can’t match your car’s value. Usually the coupons have all sorts of little black print, maybe offering money savings after spending a large sum of cash or offers that are only good a week of the year. It’s very rare any of these incentives would equal the amount of money you’re not getting from them. Do not sell or trade your vehicle for a penny less that the money it is worth. Auto recyclers don’t have the greatest reputation, but there are many salvage yards that are legitimate businesses and will give you a fair amount of cash for your junk car. There are also a lot of salvage yards that are shady. The exact number of salvage yards that use dishonest tactics is unknown. However, research shows there are over 1 million used cars that have been title washed. This means that a car was designated for scrap and was instead cleaned up and resold for profit. There are dealers out there who are making money and don’t care about morality and the law. Make sure you do your research and work with a business that will treat you right. Scam artists are good at coming up at thinking on a whim. They will deliberately say things to confuse you so the sale goes their way. These ‘shell games’ are a sneaky way to give you as little money as possible. Make sure you are leery if the salvage yard isn’t being clear in trying to explain things to you. Make sure you understand the math. Don’t let the salvage yard pressure you into making poor decisions that you aren’t comfortable with. As you can see, there are a lot of ways you can be scammed when trying to get what you deserve for your junk car. Before you make any final decisions, contact the trusted professionals at Junk Car Medics to receive a free quote on your vehicle.